The OCYA advocates on behalf of children and youth receiving child intervention services or who are involved with the youth justice system by ensuring that their rights, interests and viewpoints are acknowledged and acted upon. Advocacy is not a neutral activity. All staff at the OCYA are driven by a shared concern for young people, and a commitment to doing all we can to improve the services they receive, often through very difficult circumstances in their lives. It is these young people, who have the courage to let us know what they need, who make all our efforts worthwhile. Young people have the right to express their opinions and have their legal interests considered in matters affecting them. The OCYA provides legal representation for young people who are involved in matters under the Child, Youth and Family Enhancement Act or the Protection of Sexually Exploited Children Act. A central part of our work is to promote and raise awareness about the rights of young people and to build advocacy capacity in communities. Our staff provide presentations and participate in educational events. The OCYA’s Indigenous Engagement Consultants work to build strong relationships with Indigenous communities and strengthen our capacity to serve Indigenous young people. Our staff provide support to young people to be heard by decision makers. For those young people who are not able to express themselves, we ensure their interests are considered. The OCYA conducts investigative reviews into systemic issues arising from the serious injury to or the death of a young person. The purpose of the reviews is to identify opportunities for improving services. The OCYA is involved in advocacy efforts to influence change at a broad level. 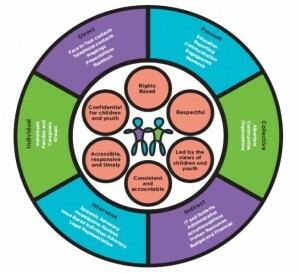 We collaborate with others to identify systemic issues and make recommendations to improve services for young people. Promotes and secures the rights and interests of children and youth. Is led by the views of children and youth. Is accessible, responsive and timely. Ensures confidentiality for children and youth.